It's nearly time for the songbirds to return to Northwest Ohio! 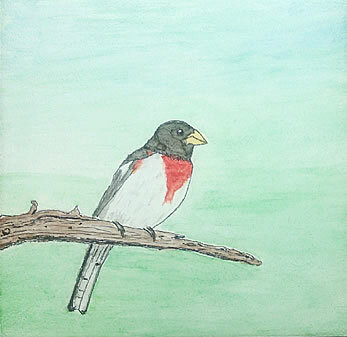 Here's a new 6 inch by 6 inch watercolor on board art piece that I finished recently of a male Rose Breasted Grosbeak to celebrate the return of SPRING!!! These birds are from the Cardinal family and in fact I have spotted a few around our bird feeder last summer, here in Northwest Ohio. What a beauty they are to see...their rose breast is quite stunning when you can spot them. And this definitely was a challenging medium for me to try. 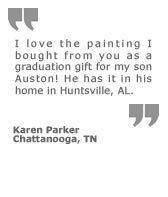 It's fairly new in the art world...watercolor canvas if you will. This piece is actually more like a gesso coated board. I was surprised at how "chaulky" the surface was...and learned that when you're finished with your work you have to spray a fixative finish coat onto the surface or your paint will wipe right off in your hand (sort of like pastels). I used ink and watercolor and am pretty pleased with the final result. 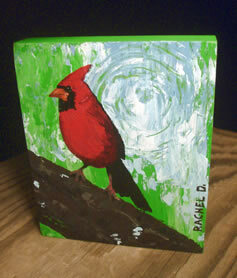 This piece measures 6 inches by 6 inches and is on a half inch think board/canvas. I'm HUGE fan of songbirds! And from what I'm gathering, so are many of you. And it seems a favorite of most is the male Northern Cardinal. I have plans to create many new pieces of "Cardinal art" throughout the winter season so stay tuned for updates here, on my art page and on my blog. These guys are so much fun to paint as you can't help but notice that each of their black masks are slightly different. We usually just see red...but note the minute details of these guys the next time you spot one. You'll be amazed at the variations! There are quite a few local wineries popping up in my area of Northwest Ohio. So why not join in the fun right? Wine and Art ALWAYS go together! I have plans to create new pieces of "Wine art" throughout the next many months and into the Spring so stay tuned for updates here, on my art page and on my blog. Sorry if you're a white whine fan...I tend to paint reds. 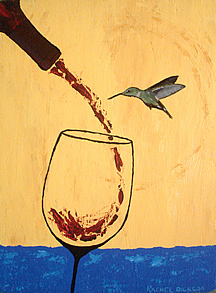 Red wine is so very eye-catching in a painting...especially when songbirds are in the mix too! Copyright © 2018 Rachel Dickson, Delta, OH. All Rights Reserved. Web Hosting with Total Choice. Website Design by Rachel Dickson! yes, it was me.